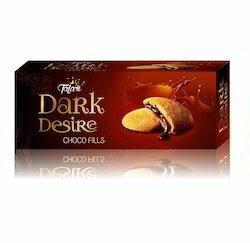 Prominent & Leading Manufacturer from Ambarnath, we offer dark desire choco fills. Backed by the assistance of our experienced professionals, we have been the prominent supplier of a qualitative grade Dark Desire Choco Fills. The provided choco fills is hygienically processed by our experienced professionals using the best grade ingredients like wheat flour, corn meal, rice flour, sugar, edible vegetable oil etc. Offered choco fills is highly demanded by our clients owing to its enriched carbohydrate and delectable taste.